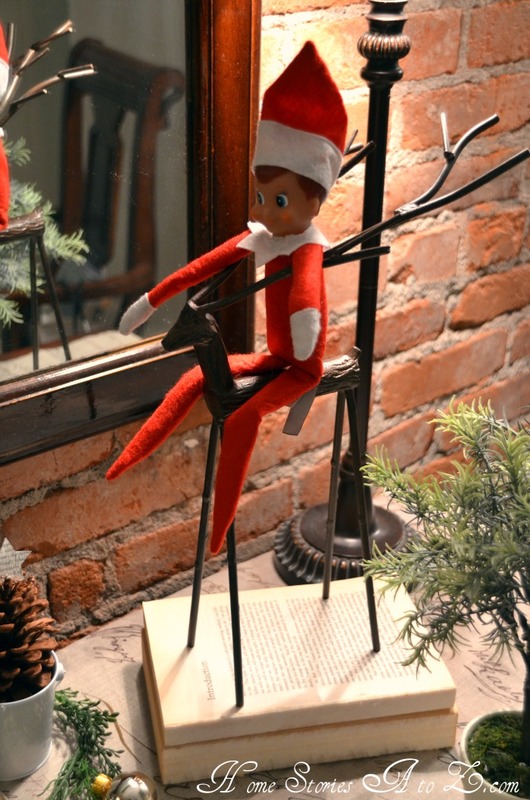 Fun ways to display your Elf on the Shelf this Christmas season! 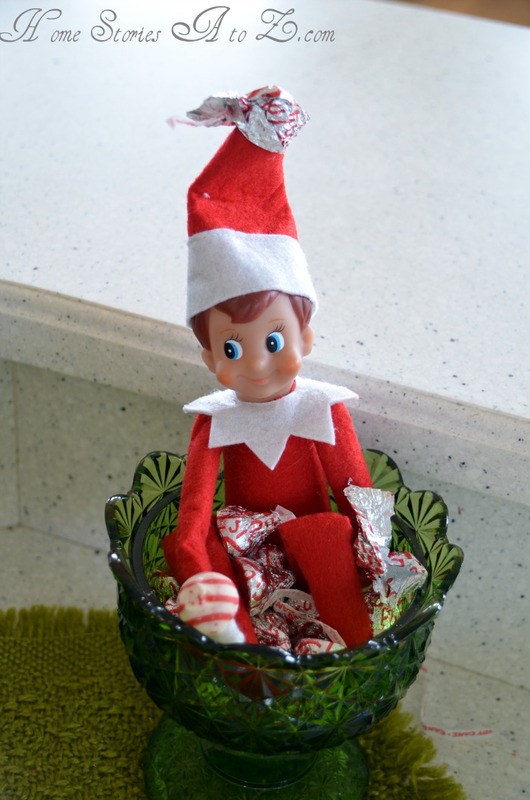 Our Elf on the Shelf is named Max and we’ve had him out and about making mischief for a week now! I thought those of you who celebrate this fun tradition (or are planning to) might appreciate seeing some of the things our elf has done so far. For those of you wondering what the deal is with these elves that sit on shelves, the basic premise is this: The elves watch your kids and report to Santa who is naughty and who is nice. Essentially they are Santa’s spies. 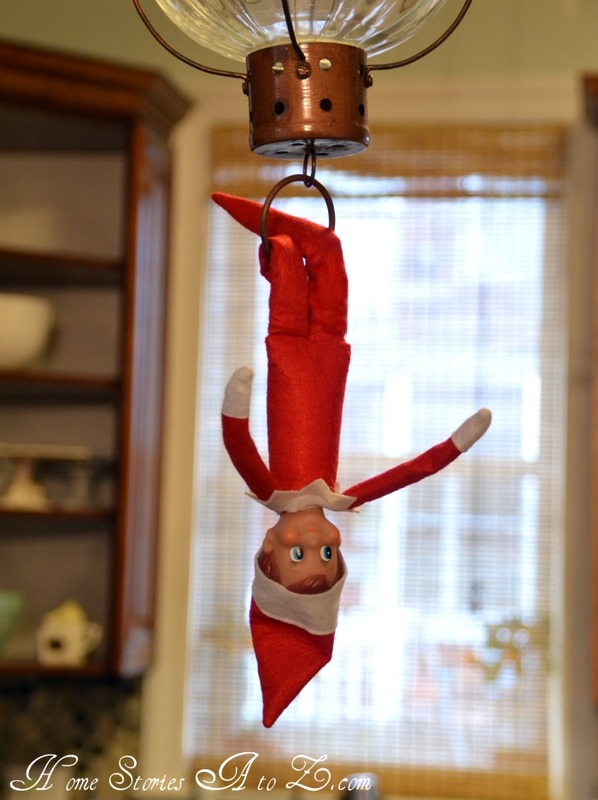 At night the elves come to life, play around your house, and can be found in a new location every morning. Granted, for some kiddos this tradition might be absolutely terrifying. For my boys, it’s just a fun game of pretend and they LOVE it! And I have to admit that I am loving it so far too! It’s fun coming up with something different for Max to do each day, and it only takes me a few minutes each night to throw together. Max making paper snowflake chains for the other toys. Max feeding Eowyn her food via a backhoe loader. Max hanging upside down from our light fixture. Max feeling a bit homesick for the North Pole and riding our reindeer. Max enjoying the beach on the windowsill at my Mom’s house. Yes, we took him with us for Thanksgiving! Max looking through a telescope at the horizon. Max raiding the candy bowl. Max playing with toilet paper. 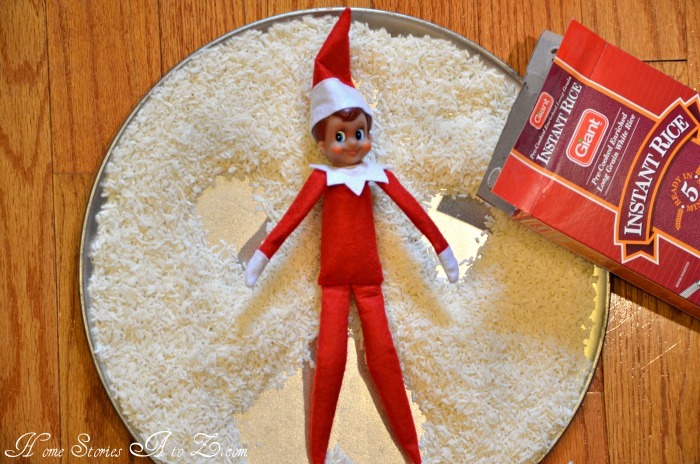 Max making a “snow angel” in instant rice. Max being mischievous with dry erase markers. Max playing Heroica with some friends. I’m looking forward to watching the TV movie tonight with the boys. Some have complained that the Elf on the Shelf is just another example of marketing to children and the over-commercialization of American culture. So be it. All I can say is that it is an absolute delight to hear little giggles each morning as Asher and Zephan discover what shenanigans Max has been up to. My boys are growing up so fast, and I am going to relish every moment that they take joy in something as simple as an elf on the shelf! I’m a journalist with Mother Nature Network, and we have an article that features your Elf on the Shelf idea. We hyperlink to your website, and we want to double check to make sure we have your permission to do so. Beth, thanks for reposting this! Our kids are grown now, but when they were little, we had so much fun every evening helping the elves decide what mischief to get into! Brings back wonderful memories!! 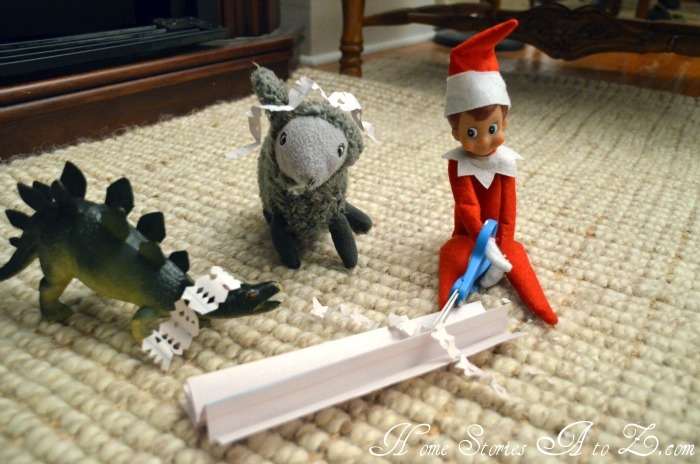 Great collection of elf on the shelf ideas. Like the one of max making breakfast! This will put a smile on my kids when I try it! Me and my hubby have been doing this for past 5 yrs….our daughters are 9 and 4 have been talking for weeks about their elf “rosalina” ariving soon. It is sometimes stressful planning on what she will do…my husband waking in a panic…”did u move the elf?” Or me! “Where is she??? ?” But it is so fun for the kids! This yr im gonna try to plan ahead so there isnt too much stress! These are just cute as they can be. I also agree I don’t care what anybody thinks about marketing to children. We love our elf. I enjoy seeing how giddy and happy my five year old is each morning to see what Clyde has done. We started ours around thanksgiving also. These are real cute ideas! This is the first year I am doing this with my daughter…How did you make those tiny pancakes?! Thanks Micki! I put pancake batter in an old (thoroughly washed out and cleaned) mustard container and squeezed out a tiny amount into the skillet. They were a big hit! I found your post via Pinterest. 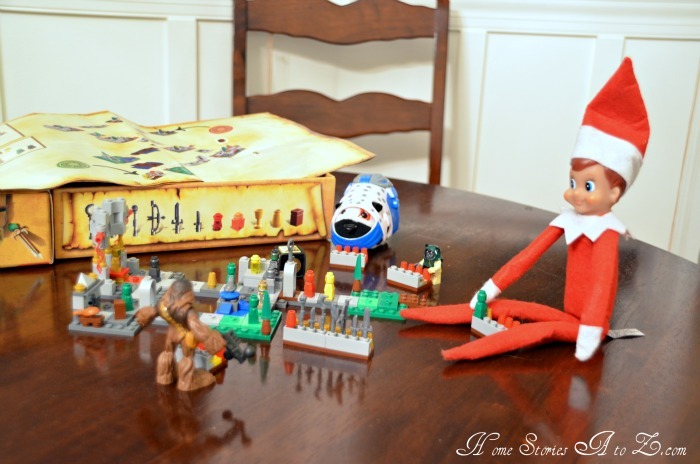 I’m hosting an Everything Elf on the Shelf link up and I’ve love for you to come share! okay…. you may have just talked me into it…. this momma will do just about anything for giggles!!! Oh my gosh! So cute! Such creative ideas! I love the mini pancakes! I am definitely going to have to try that! My little girls will be so excited to eat breakfast that our elf, Sara, made! Thank you! 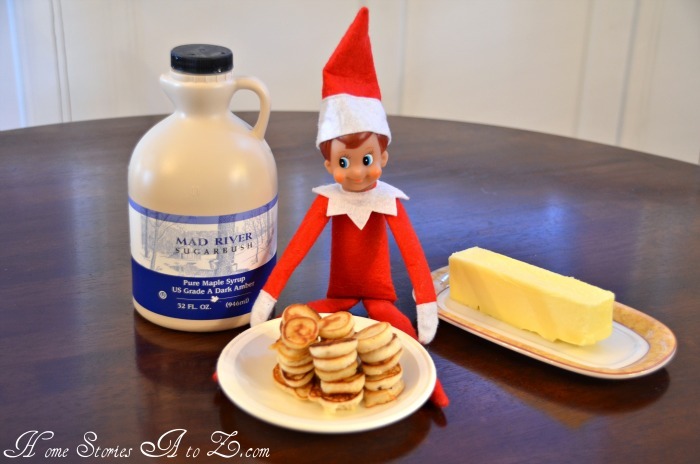 We have used an elf since out oldest son was a baby -we would move him around to different places too, although not near as creative as your adorable pictures -all of them are funny but Max making the pancakes is too funny. ( and they are just the size he would make!) So the oldest is 26 now and the other three boys are all teenagers -they pretend they don’t care about the elf but I secretly think they enjoy the tradition . So Beth enjoy every minute of this holiday season. And thanks for capturing these great projects and photos for your readers-I always leave here motivated. What fun! Those teeny pancakes are darling! I agree with your “the over-commercialization of American culture. So be it” statement. And someone even asked me if my children were scared or worried about the elf. My response was I think it is all about how you use the elf and our elf is all about mischief, laughs, giggles and fun. See for yourself at http://elfontheshelfideas.com. To your readers: Please don’t think your children are too old to start this tradition! My daughters are 13 and 16 and I just started this year! They think Finn is the most adorable thing ever and go out of their way to find him before they leave for school. Pranks are the best way to keep them interested…so far Finn has made a snow angel in corn meal, made miniature doughnuts for the family (cheerios plus powdered sugar/sprinkles), wrote his name in toothpaste on their vanity! They LOVE it and so does my husband! Go for it!! This will be our fifth or sixth year with our elf, Magic. He’ll arrive this weekend because I forgot about him, but my kids have looked for him already. Did you have to put wire in him so he’d stay in those fun positions? My little Elf Chauncey is hard to set up. Any information would be helpful. I haven’t cut this hands apart yet, but will soon. No, no wire, tape, or anything else. I had to use a clear rubberband (that I saved from some other packaged toy) when I hung him upside down but otherwise he sits and stays put fairly well on his own. Hi there, how do you get your elf to sit straight up on the floor and into different poses? Glue dots or tape? I haven’t had to use any glue or tape yet. I’ve felt some elves who actually have magnetic arms and legs which would make things much easier! Mine has bendable plastic with just a little give and support. I don’t have any trouble having him sit but if I want his hands together I have to get more creative. I do have clear rubberbands that I used in the picture where he’s hanging upside down but besides that I haven’t needed to use anything…yet :). I just love this idea! I have some vintage elves that usually sit on our tree. This year they are going to make their way around the house! Thanks for a fun idea. My daughter is 10 and she just got “Elvish” this year. She’s at the “I believe, cause if I don’t there won’t be any presents” stage. I’m having fun hanging him around the house. 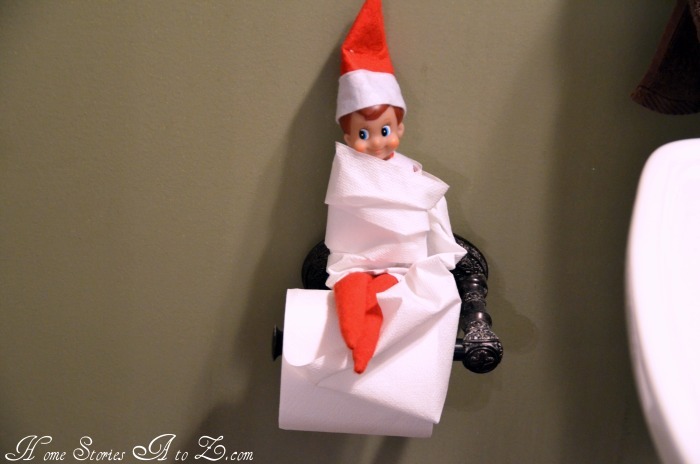 This will be our 1st year Elf on the Shelf will come to visit, I am going to pick it up Wedensday. What is one of the best ways to introduce the Elf to my 4 year old Daughter? We just introduced ours two days ago. I told her that it was coming, but I wasn’t sure how. While my husband and my daughter were gone, I unwrapped it and set the book and the elf out, at the top of our staircase, out of sight. When she went upstairs later that night, she found it. Here here!! Amen to that! LOVED the pics & got a GREAT laugh out of it 🙂 My oldest is 21 & my youngest is 7 and it DOES go by fast so you HAVE to enjoy all the fun stuff while you can!! Love this!! 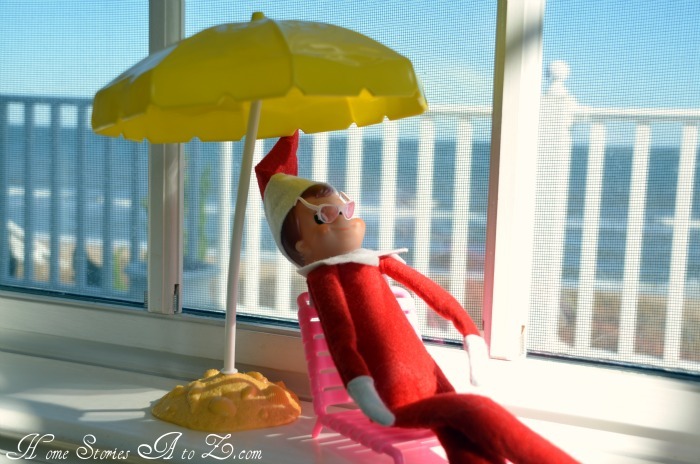 I had an elf growing up but he was never so busy as your’s. If I recall he always sat on top of some artificial Christmas greens with his legs crossed. He had a boring existance. What great memories you’re making with your kids. i think it’s so cute as long as the real meaning of christmas is still celebrated! there are lots of cute things on pinterest that the elf does. flour snow angels, turning the milk green etc. While I was watching the little Elf on the Shelf TV special with the boys, Zeph said to the TV, “The real of meaning of Christmas isn’t just believing. It’s believing in Jesus as Savior.” I think we’re good :). that is so sweet, that’s the true spirit of Christmas! they have lots of traditions to remember!! When we read the book I emphasized that kids can’t move him or he’ll lose his magic but that the rule doesn’t apply to adults. They know that we are the ones who can touch Max and will even remind us to put him back on the shelf in the morning :). I tell my daugther that mommies and daddies can move him out of harms way or to make him comfortable, but that’s it. I set up the elf at night and the kids are delighted to see him in the morning. Right after they find him, I replace him back on our fireplace mantel until I’m ready to move him the next night. This is such a cute idea, Beth! We don’t have kids at home anymore either, but I think Judy has the right idea. Too old???? I’m doing this for my hubby this year. All our children are living away this year and he’s a little bummed. Asked my son (21) what he thought about the idea and he said, “I wish I was going to be here.” We’re never too old for a little fun. How adorable and funny. I wish I had done something like that for my son when he was younger. He’s 12 now and would just think I lost my mind! 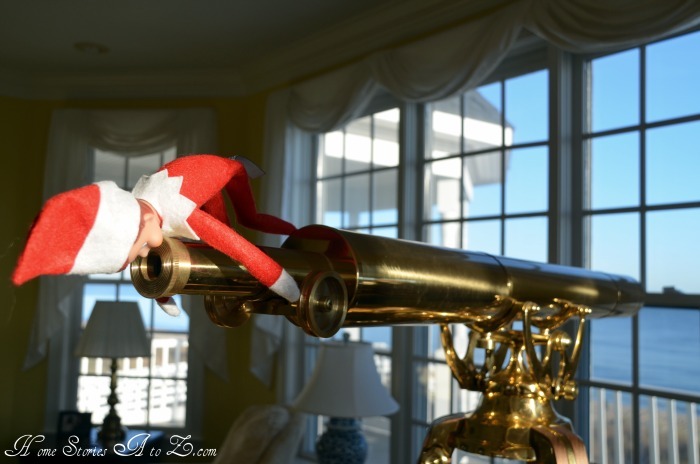 Who knows maybe and elf may just slip into our house…. Thanks for these cute suggestions! I didn’t grow up with lots of Christmas traditions, so I look forward to introducing our kids to memories like this, when they get old enough. (Our daughter is only 15 mos. now.) I appreciate seeing a glimpse into how another family “does” Christmas! ha! That kleenex box one is priceless! Love it! You are so funny! So cute! hummmm, nice window sill at your moms overlooking the water!!! 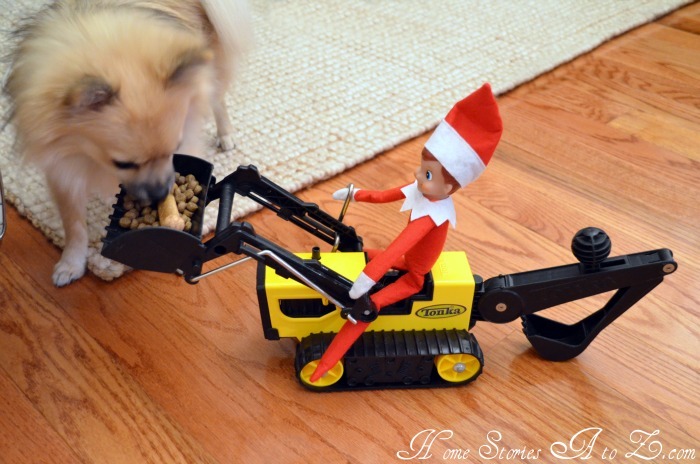 I love the backhoe & dog food! My son enjoyed looking at the pics….and he said, where is my elf? I need to unpack him tomorrow! 🙂 Hope you had a good thanksgiving! I just ordered one on Ebay last week for about $30. Found some at Target a few days ago in the books/music section. I ordered my daughter’s from Target a week or so ago. It was priced at $29.99, it came with the elf and the story book. I also ordered a little skirt to go with it to make our elf a girl. 🙂 This will be our first year and I think she’s going to love it! Have fun and enjoy those children. Things like that elf are what make memories. We had a stretchy Steve Irwin doll (The Crocodile Hunter) years ago and we played hide and seek with that thing for a year. My daughter is 16 and still talks about it. There’s always grandbabies to come! Kids are never too old. I started this year with my 10 and 13 year old daughters. The oldest doesn’t believe in Santa but loves getting up every morning to see if they can find their elves. where do you get the elf from? I want to start this with my little kids. Just got mine from Amazon.com I am super excited about him!!! He is just so darling!!!!! For those that think there kids are to old, NOT true. Mine have had a blast taking turns every other night. I love the creativity they have put into. I wake up delight to see what Tiny Tim has been up to!!!! !